5 Bedrooms, 2 full bathrooms, 1 half bathroom, sleeps 13. 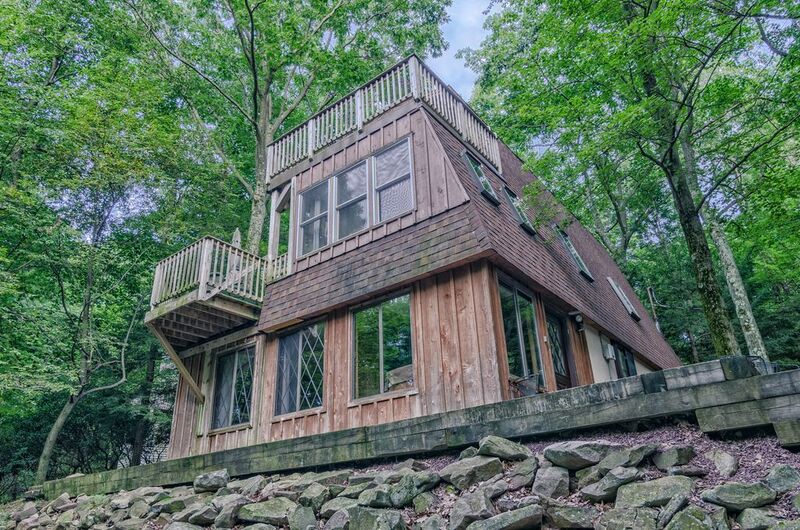 This 3 level Mountain home is perfect for large family gatherings. There is a great room dining room combo with beautiful views of the mountains. There is a separate living room/den downstairs with a bar, pool table and a hot tub located in the sunroom. There are 2 indoor fireplaces and lots of beautiful wood details. The home is within walking distance to the private beach and comes with 10 beach passes doing the season. Split Rock Lodge and the new H2O park is a 5 minute drive. Split Rock also features a movie theatre, video arcade, gym and tons to enjoy all year round. Just 3 miles to Jack Frost and 2 miles to Big Boulder. Private back yard backing up to wooded space. Coffee maker, 4 ring stove, freezer, blender, grill, toaster. We enjoyed our stay very much. The house was everything we expected. Very clean and cozy. Loved the cabin feel of the house. Thanks Again! The house was awesome and well prepared. It was so close to everytging we needed. House is clean and comfortable for a group of guests. Thanks for the great stay. The house was beautiful, clean and well kept. Everything was labeled and easy to turn on. We recently had a girls trip to the mountains and our stay here was wonderful! The house was well kept and everything was labeled and easy to find and turn on. The only issue was the hot tub getting stuck in Ec mode but Scott called right away once notified and walked us through fixing it. The deer in the back yard were so beautiful and friendsly. I look forward to staying here again! Nothing but amazing things to say about this property. It was an unbelievable cosey place for gathering of friends and family. Nice decor, plenty of space with great amenities. Awesome atmosphere. It was misty all weekend, but that just added to the cabin in the woods feel. Would definitely recommend to a friend for a weekend stay.